It’s not possible to right click on the Desktop and changing the background by using System->Preference->Appearance would not help either. As I learned later from a new Hollandish friend, nautilus failed to start and therefore the Desktop cannot start proberly. Now, I don’t know any better, all I know is as soon as I start nautilus back up using terminal, the Desktop appears like magic. So the solution was simple Restart Nautilus. In fact, restarting nautilus can solve a lot of problem when something does not display correctly. I finally gave up on PCman File Manager and decided to stick with nautilus after all. A few days ago, when I decided that my 5GB partition for Ubuntu is getting a bit too crowded with all kinds of applications, I uninstalled a bunch of software through synaptic. Well, one of them is Evolution. I freed about 1GB of hard drive space. However, disaster stroke, everything disappeared from my desktop. I saw nothing on my desktop, no menus, no icons, no panels and not even my beloved desktop background but a smooth orange background. I freaked out. After several restarts, things did not help at all. I needed to get online for some help, and the only way to do that was to open Firefox. So I opened terminal -> Ctrl+Shift+T (Thank god for the shortcut, otherwise I’m dead). Typed in firefox, it opened firefox! nice. Now, this guy had a similar problem, and the solution seemed very simple. I posted it here. 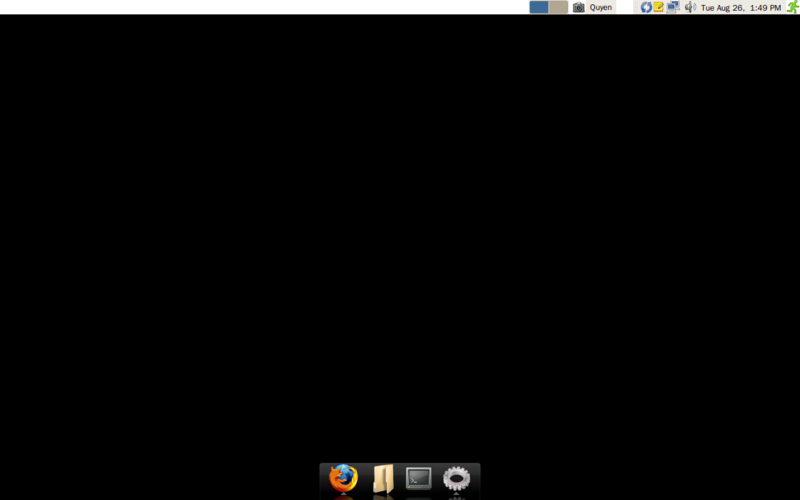 After uninstalling several packages in Synaptic, the desktop just goes blank and there is nothing, not even icons or panels. We need to reinstall ubuntu-desktop, this will reinstall all the default packages. After you are done, return to x-server by Alt+F7 or just restart. Interestingly enough, if you would like to have packages installed in Kbuntu or other distribution, there you can do so with a similar process as above. The only thing different is it would be Kbuntu-desktop (or else) instead of Ubuntu-desktop. Check Synaptic. To continue my quest on learning more about basic linux commands, I stumbled over this page called The One Page Linux Manual that provides a pdf file of basic commands and explations that I really need to know. Check it out. I post this here mostly for personal reference in the future. When you execute something that you did not want to happen, the output just keeps going like crazy and you really want to stop it. For example, I enter locate a, the command will search for everything with the letter a, which means millions. I need to interrupt and stop the execution. This will stop everything. Use this command wisely, you don’t want to interrupt an installation as it will mess your files and directories up. There are two things (that I know of) you can do in Linux to get some help with the commands in the terminal. The input above will give you all options available for sudo command without any explanation or lengthly credits and copy right statements. The output looks like this, short and to the point. sudo allows a permitted user to execute a command as the superuser or another user, as specified in the sudoers file. The real and effective uid and gid are set to match those of the target user as specified in the passwd file and the group vector is initialized based on the group file (unless the -P option was specified). If the invoking user is root or if the target user is the same as the invoking user, no password is required. Otherwise, sudo requires that users authenticate themselves with a password by default (NOTE: in the default configuration this is the user’s password, not the root password). Once a user has been authenticated, a timestamp is updated and the user may then use sudo without a password for a short period of time (15 minutes unless overridden in sudoers). I’m sure some of you have been using one or two Linux command regularly. For me, I use top and cd the most. There are many commands in Linux that are fun and useful. For instance, some of you might have know the fortune command that gives you random fortune and jokes, some of which are not too bad. Using terminal and command could be painful sometimes because there is no way we know all those commands in Linux, there are hundreds of them, and each have a dozen different options, one of which could be fatal to our system (and ourselves). The key to avoid a disaster is to know what we are doing, and linux offers some great help. No, not the Ubuntu forum, you have to wait for someone to answer. No, not google, what if your internet is not working?. The commands above will help you sometimes in the future and it is a great tool to learn what you are doing.